Proportional Representation , Roprortional Prepesentation! I argue at A New Kind of Third Party that fairness in the form of proportionality in political representation is less important than making our political system have a more dynamic and inclusive center. I argue my typical point that with relatively modest changes in electoral rules that the two major parties could become very different from their current incarnations and that political outsiders would gain more influence on the center or protection for their rights. (How Much) Will Europe Help Support Movements for Electoral Reform in the USA? In our increasingly interconnected world, the follies of US politics spill over quite a bit into the rest of the world. So the question is what will those who have pushed for electoral reform in their own country do to help foster electoral reforms in the US? So I'm sure there already are efforts afoot, but I get a lot of traffic at "A New Kind of Third Party" from other countries, especially the Netherlands where there's been some significant changes in the electoral system in recent years. I guess it's easier to find a receptive audience for electoral reform blog-posts among folks who already have studied and debated electoral reform issues a good deal. God knows that's not the case yet in the states, but that's gonna change! Why the Electoral College Should Be Revamped to Prevent the Election of an Extremist US President! Over at A New Kind of Party, I reposted just the portion of an earlier post that illustrates a two-stage election with five candidates in the first stage and two candidates in the second stage. The moral of the story is that both the first stage and the nature of the interactions between electors at the Electoral College would make it nigh impossible for the US to elect an extremist as president. But unfortunately, such might happen with a direct election, or our current defunct Electoral College system. ps, if you substituted vice president above for president, it would be almost as bad, since a Manchurian Veep would be only one heart beat away from becoming the president of the USA. The nomination of the establishment favorite, while celebrated by local Republican officials Monday night, drew an ominous warning from western New York tea party activists who immediately vowed to pursue a third-party candidate. . . . The classification of the Harford County Democrats as a "fringe" party would be funny if the thought wasn't so sad ("Harford Democrats termed fringe party, shut out of redistricting," Feb. 16). Councilman Richard Slutzky's argument that letting Democrats into the redistricting committee would be as unfathomable as (gasp!) letting in the Green Party has no doubt rubbed a sore spot with the Dems. Let me send a brief letter from the fringe to a party that has no idea what the fringe really is. As the state chairman of the Green Party, I am well aware of how the law is turned against those (Greens, Libertarians, the Constitution Party) trying to make better policy through the electoral process. I find it hard to sympathize with the Harford Democrats' plight (the irony that they themselves implemented this legal exclusion aside). All Maryland Democrats maintain the legal status of their party and candidates without a lengthy, expensive petition process — the Green Party cannot. Democrats are entitled to a state-funded primary election to promote their candidates — Greens are not. When was the last time a debate organizer — many using public resources to promote their events — had to decide whether the Democrat would be invited or not? Greens, when we can qualify for the ballot, almost never are. Perhaps the exclusively-Republican redistricting committee will further gerrymander the Harford Democrats into oblivion. They can then feel firsthand how restrictive ballot access laws make it impossible for a minor party to keep up with their opponents' unfettered organizing, leaving them incapable of preventing further legal restrictions. The cycle of abuse then continues. Maybe, just maybe, this brief escapade will give Maryland Democrats a glance at what it's really like on the fringe, and how the law puts us there. Matt Reichel, 29, a freelance French interpreter, is running for alderman in the 47th Ward. He is a peace activist, Green Party organizer and most recently worked for the William Wrigley Jr. Company. "I understand the tedium of political organizing, and the strength of character that is required for a demanding job of this nature," Reichel said. "Furthermore, as a progressive, I see the need to fight to defend the public sector from encroachment by greedy and unaccountable private interests. "As alderman, I will be the foremost spokesperson in the city council for defending the public domain, the public pensions and public utilities. I consider it disingenuous and negligent that public officials do otherwise." Windy City Times: What are your strengths? Matt Reichel: I have an advanced degree in diplomacy, [and] earned over a three-year stay in Paris, where I obtained a worldly understanding of international relations and the dynamics of cultural interaction. As such, I have a keen ability to relate to people from a variety of different backgrounds, and an even keener ability to negotiate, debate, and stand my ground. . . . The Wisconsin Green Party salutes the state’s public workers, and stands in solidarity with their fight to retain full collective bargaining rights with their employers. While Walker attempts to divide workers into “haves” and “have-nots,” he continually pleads the case for the real “haves.” At a time when profit margins at the S&P 500 companies are at an all-time high, taxes for these corporations are approaching all-time lows . . . The race is heating up for Libertarian delegates to choose a new chair at the Libertarian Party of Florida's 2011 State Convention happening the weekend of April 30th in West Palm Beach, Florida. There are currently four contenders for the position, all of which will face off during a radio broadcast and Internet show debate Friday, March 25th on the Liberty Underground Show at 9AM. Why We Need a 2 Stage US Presidential Election! At my main blog, I have posted an entry that gathers my thoughts on how the US's Electoral College(EC) system might be revamped. I believe the EC could be the basis for a cost-effective 2 Stage Presidential Election to guarantee that we have better elections and a centrist, non-extremist president and to give more attention to local issues. This would be very much in the spirit with which the Electoral College was first adopted for the USA. In the same spirit, I suggest at the end how the finalists could select their Vice Presidential candidate from among the other four or six contenders in the General National "Open" Primary. 2/14/11 - This morning members of the Kentucky Red & Anarchist Action Network hailed the approach of warm spring weather with a glorious assault against the offices of the Fayette County Republican Party, leaving plenty of laughter and broken glass in our wake. With a wink and a nod, we acknowledge our unity of purpose with the members of RAAN who smashed up a headquarters of the Democratic Party in California last October. If there were a viable third party in the United States, it would probably be necessary to attack them as well (not forgetting of course our actions against Ralph Nader several years ago). . . .
With more than one third of the country self-identifying as independent, the balance of political power is falling increasingly to whichever way this group swings. Since the presidential run of Ross Perot, those the use of “independent” has often been shorthand for “disaffected white voter.” Dig a little deeper, though, and you’ll find more people like Gravely a part of this paradigm shift. She was among the hundreds of others that gathered in New York last weekend to assess the 2012 landscape as part of the National Conference of Independents. Participants discussing how they could reform America’s political system came from as far west as Oakland to as nearby as Queens . . . Landslide victories for independent candidates in local elections in central Japan earlier this month shocked the nation's two major parties and revived public doubt about the nascent two-party system. 'It is the beginning of the collapse of the two-party system,' Minoru Morita, a veteran political analyst, said. The independents, Hideaki Omura, and the Nagoya Mayor Takashi Kawamura, who campaigned for tax cuts, defeated candidates endorsed by the big parties in the Aichi gubernatorial election and the mayoral race. It is time to establish a Conservative Party of America that will bring together all conservatives under one umbrella – Tea Party, 2nd Amendment, Constitutionalists, pro-life, pro-family, Christian, anti-terrorist, traditional marriage, private-property rights, secure borders, pro-military, pro-nuclear etc. This would not be just another political advocacy group. It would be a whole new party to add to Democrats and Republicans. It could run candidates for everything from town council to president of the United States. Today there is no such party. The Tea Party movement indeed represents conservatives, but it is not an official party and its focus is strictly fiscal. Even still, in its short history, the Tea Party helped to sweep hundreds of candidates into office in 2010. And we need to build on that success and that momentum . . .
Watch the premier of the latest political documentary by Jackie Salit, the President and Founder of IndependentVoting.org. This multimedia presentation covers the impact of the independent movement on the Obama White House, on Congress, on the political parties and on a cross section of political forces. This cutting edge documentary is a great introduction to independent politics. It explains the relevance of the independent movement to urgent social, economic and cultural problems in America. Hear a "Talk/Talk" conversation with Jackie Salit and Dr. Fred Newman, the Stanford-trained philosopher, playwright, author and pioneer of independent politics. Talk/Talk is a Newman/Salit specialty - think Charlie Rose, Oprah and Aristotle all rolled up into one! Are you a fan of Law and Order, The Good Wife, or even Judge Judy? If so, you don't want to miss this. We will be staging a mock trial to explore a fictional (but not improbable) "people vs. the parties" controversy. A cast of prominent civil rights and election lawyers, actors, elected officials, and a famous "surprise witness" will stage a courtroom trial and in the process shed light on the growing conflict between parties' rights and voters' rights. Get the inside scoop from IndependentVoting.org’s leaders on what's happening on the ground, behind the scenes, in the hallways of power and on the street corners, as independents intensify their efforts to enact structural political reforms like open primaries across the country. This is independent politics straight from the source. Conference attendees will have the opportunity to discuss the days’ proceedings in an open mic session, not to mention the chance to meet and mingle throughout the day. In an interview with the Associated Press, Scott Walker proposed stripping nearly all government workers of their collective bargaining rights. And as a warning shot across the bow, he told Wisconsin reporters Friday that he's alerted the National Guard ahead of any unrest, or in the event that state services are interrupted. Does Top Two voting make elections more democratic, or is it in fact anti-democratic? Top Two, just so we're clear on the issue, is defined in this manner: "In a Top Two election system all candidates for an office run against each other in the first round of voting. The two candidates with the most votes in the first round are nominated to move on to the final election. In the final election between two candidates, the candidate with the most votes wins." While a variety of organizations are working for electoral reform that will give more sway to independent voters and voters in the political middle, there are sharp disagreements about Top Two in particular. We have asked proponents on both sides of this argument to state their cases. On the pro side is Nancy Hanks, who runs The Hankster blog and is affiliated with the Committee for a Unified Independent Party. Speaking for the con side is Solomon Kleinsmith, who operates the Rise of the Center blog. With today's opening pieces, we begin a series that will follow with two rounds of rebuttal and one wrap-up where the two will discuss their areas of common ground. The debate starts with Nancy . . . THE EGYPTIAN WORKING class is one of the oldest in the region, with a long history of internationalist solidarity. Egyptian loading and longshoremen workers in 1947, for example, boycotted the Dutch ship in Canal Suez in solidarity with the Indonesian people’s independence struggle. The union of the workers issued a statement against colonialism in general. They did not allow the ship to service or go through the Canal despite the resistance and efforts made by English and French administrators. The early 20th century began with a wave of strikes, partly in reaction to discriminatory policies adopted by British colonial administrators who favored European over Egyptian workers . . .
Ron Paul will not run as a third party candidate. I was on his national conference call last night and he said himself, "we don't want to lose my congressional seat". He said he would continue in the Republican Presidential primary as long as the money and support are there, just like he's been saying. But he very specifically mentioned his congressional seat and he was taking care of various votes and other business in congress the last couple days to ensure he would be ready for the primary vote for his seat in Texas next month . . .
Fourty four out of the 52 Republican members the official 'Tea Party Caucus' voted to renew expiring provisions of the Patriot Act on February 8th. Seven out of the 26 Republican Congressmen who voted NO on the Patriot Act yeterday are listed on Michelle Bachmann's official 'Tea Party Caucus' list. The seven were Roscoe Bartlett [MD],Rob Bishop [UT], Paul Broun [GA], Tom Graves [GA], Kenny Marchant [TX], Tom McClintock [CA], and Denny Rehberg [MT]. Doug Lamborn of Colorado, another Tea Party Caucus member, is one of five Republicans who did not vote on the bill. The official published list posted on Bachmann's website includes 52 members. The list has not been updated since July 21, 2010. Some reps may consider themselves aligned with Tea party type values, but for one reason or another, refrain from joining the list. Only the most naive Americans could possibly believe that the GOP's so-called "Tea Party Caucus" is anything other than a PR stunt, or that these creatures have any respect whatsoever for the Constitution and the Bill of Rights. The vote in support of these provisions is a vote for illegal and unconstitutional search, seizure and surveillance of the people of the United States by the federal government. It is an abomination. 68% of Likely U.S. Voters believe that government and big business already work together against the interests of consumers and investors. The latest Rasmussen Reports poll shows that only 13% disagree with this assessment, while 18% are not sure. The view that government and big business work together against the interests of others is shared across partisan, demographic and ideological lines . . . This is the first of a series of polls we will be putting up throughout 2011 in order to gauge interest in potential presidential candidates for the Green Party ticket in 2012. To date, none of these candidates have publicly declared interest in the nomination, their inclusion in this poll was at our discretion . . .
A coalition of electoral reform groups wants to open voting choices beyond the two-party system in North Carolina. Republican State Rep. Stephen LaRoque of Lenoir County said Tuesday he plans to introduce legislation reducing the number of signatures an independent candidate or a third party would have to collect to appear on Election Day ballots. The state's threshold for a third party is one of the highest in the country. . . . The Nashville/Davidson County Libertarian Party has set up this web page to help Tennessee activists lobby for a new, better ballot access law for minor parties. As the page explains, the old law was declared unconstitutional last year. The page also features an ideal new law. The wording for the new law is identical to what was introduced in the 2007 session of the legislature. The 2007 bills, SB 288 and HB 626, did not pass. . . .
County Controller Melinda Kantner is leaving the Democratic Party. During a fundraising event Friday night at Blu Tavern Restaurant, Kantner announced she'd be seeking re-election as an Independent. "I was an Independent before I ran for controller in January 2007. It's what I'm going back to," Kantner said. She has served as county controller since January 2008 as a Democrat . . .
County Controller Melinda Kantner has made history. Since at least the late 1890s, there has not been a sitting county row officer or commissioner who has not belonged to either the Republican or Democratic party, according to county Election Bureau records and election results in the Schuylkill County Archives Office. "There's a first time for everything," Kantner said last week. Two weeks ago, the incumbent ditched the Democratic Party, became an independent, and is now gearing up for a potential three-way November General Election. Decades ago, races for county row offices were often melees. For example, in the 1915 county elections, at least six parties fielded candidates. The mainstay Republican and Democrat parties had candidates on the ballot, but so did the Washington, Citizens, Socialist and Labor parties. Those parties were represented on the ballot for prothonotary, controller, county commissioner and other offices, according to county archives . . . The local American Legion and Legion Auxiliary sent out applications this week to local high school counselors for the 68th annual Gem Boys State session and the 65th session of Syringa Girls State. Boys State will run from June 12 through June 18 with Girls State to follow from June 19 through the 24. Both sessions will be held at Northwest Nazarene University in Nampa. The programs are week-long, intensive, hands-on programs on how government in the State of Idaho works. . . . When the delegates arrive in Nampa, they are divided into two fictitious parties to learn how the two party system works. A Senate bill would make it easier for third-party candidates and independents to appear on the November ballot. Republican Sen. Mike Folmer, of Lebanon, introduced the Voters’ Choice Act, which is supported by the Pennsylvania Ballot Access Coalition. Folmer’s chief of staff, Fred Sembach, said the act levels the playing field for third-party candidates to appear on the fall ballot. Republicans and Democrats appear on the general election ballot after winning nominations in a primary. 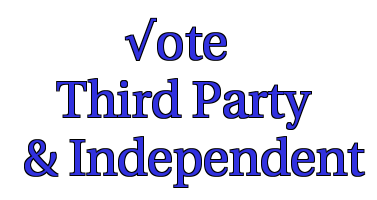 Independents and third-party candidates do not have a primary. “It’s more options for voters — hence the name voters choice,” Sembach said. . . . Under the proposed legislation, to appear on the general election ballot third-party candidates would have to obtain the same number of signatures as candidates from the two major parties. Also, an individual from any party would be allowed to sign a petition for a third-party candidate. As many as a dozen candidates for the Columbus City Council could crowd the May primary ballot. Four Democratic incumbents, four Republicans, three Libertarians and an independent candidate all filed petitions yesterday to run in a field race for four seats. . . .
Libertarians Mark M. Noble, Andrew S. Ullman and Robert F. Bridges filed 1,556 signatures. Genaro R. Garcia, an independent, filed 1,579 for his solo run. Noble said he's proud that the Libertarians are the only third party fielding a slate of candidates in the race. "There's a debate over who the true third party is in Ohio," he said. "Here we are, coming through with this when other parties failed." A slate of Green Party candidates and candidates identifying themselves as progressive Democrats took out petitions but did not file yesterday. Quick note: Michael Lewis of Independent Kentucky has worked hard to bring the issue of open primaries to the attention to the people of his state, and has been instrumental in various legislative initiatives. Pease see Hankster friend Ken Bingenheimer's post on the collective Examiner.com pub about Common Ground -- btw, Hankster will participate next week in a tete-a-tete with centrist Solomon Klinesmith on the issue of open primaries... Stay tuned! Senate panel approves bill to let independents vote in primary elections (Bluegrass Politics) Registered independents would be allowed to vote in a party’s primary election under a bill the Senate State and Local Government approved Wednesday. A new survey conducted by Public Policy Polling has found that 37% of Americans and 51% of Independents are open to supporting a third party candidate for President in 2012. And there is good reason to believe these numbers significantly underestimate the level of support for an alternative to the Democrats and Republicans. . . .
A look at the poll’s crosstabs shows that Independents are, unsurprisingly, most open to a third party candidate for President in 2012. 51% of Independents expressed openness to the idea, compared to 44% of Republicans and only 24% of Democrats . . .
A recent Rasmussen poll found that 46% of GOP primary voters would likely support a third party candidate if Sarah Palin did not win the Republican party’s nomination for President. But a Rasmussen poll from late last year found that 31% of GOP primary voters would likely support a third party candidate if Sarah Palin did indeed win the Republican party’s nomination for President. OH: Independent Movement Gaining Steam at Local Level? SALEM - Republican Mayor Jerry Wolford switched to being an Independent candidate for mayor for the second time in his long political career. On Tuesday, after Councilman at-large John Berlin announced he would challenge Wolford in the Republican primary on May 3, Wolford said, "I feel strongly that all the candidates should have the right to let all the voters decide who they want for their mayor. "Therefore I have decided that I will be running as an Independent candidate in November." Three more Republican candidates have announced they will run for Salem City Council. has announced he will run for the 2nd-Ward seat, and Rick Drummond has said he will run for the 3rd Ward. Cynthia Baronzzi Dickey has announced she will run for the 4th-Ward seat. Bob Thomas David Nestic, the incumbent councilman from the 1st Ward, filed as an independent candidate and will not be opposed, said Dave Johnson, Columbiana County Republican Party chairman.